It's Thursday, which means it's time for Craving Ellie in my Belly! This week's Ellie Krieger recipe is Sweet Potato Peanut Soup, hosted by Mary at Popsicles and Sandy Feet. Ellie calls it something a little different, but I've been enjoying renaming her recipes for no good reason, so bear with me. So, about the soup. We adored it! It was the first chance I had to use my new birthday-present immersion blender (thanks Mom!). I'm hooked on my new appliance; I just want to go around collecting chopped up food to puree... is that weird? This was also the first time I've cooked with these types of flavors all together in one dish. The texture was great, but next time I'll use chunky peanut butter, I think that bit of roughness would make it perfect. I topped the soup with a dollop of sour cream (don't waste your time piping it like I did, it sinks anyways), some green onions, and a sprinkle of crushed peanuts (quick and easy tip: buy whole peanuts, put them in a ziplock bag, and go to town smashing them with a meat tenderizer). We both agreed that the sour cream was key, so I highly recommend adding it even though it's not in the original recipe. By the way, did you see the heart-meltingly adorable heart spoon in the picture up there? It was a birthday present from my friend Mary. Look at the handle! 1. Heat the oil in a large soup pot over a medium-high heat. 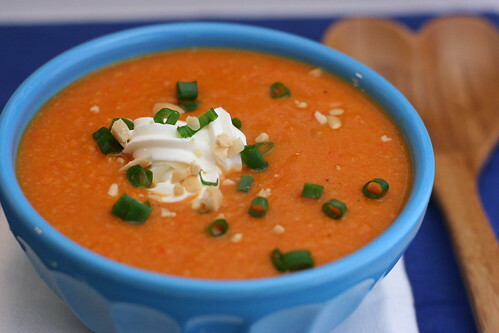 Add the onions, bell pepper and carrots and cook, stirring until the vegetables soften, about 5 minutes. Add the cayenne, black pepper, garlic and ginger and cook for 1 minute more. Stir in the sweet potato, broth, and tomatoes and bring to a boil. Reduce the heat to medium-low and simmer until the potatoes are tender, about 20 minutes. 2. Puree the soup in the pot using an immersion blender or in a regular blender in 2 batches and return the soup to the pot. Add the peanut butter and honey and stir, over low heat, until the peanut butter melts. Serve warm, garnished with the scallions. Please see this post for tips on safely pureeing hot liquids in a blender. I love the color! It is so bright! Sweet potatoes are so yummy! And they have this natural sweetness. This sounds great - the closest I've made to this is a tomato cashew soup, which is of course completely different. 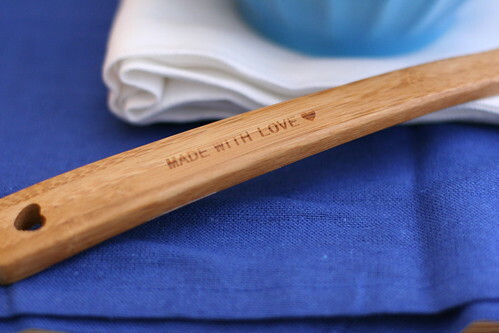 ;-) Adorable spoon, and perfect for you, I might add! Delish! I love the piped sour cream. Great job on the photo op before the sinking happened. I got that very spoon AND an immersion blender (which I'm obsessed with)for Christmas 08. Hmm. Neat. Chunky peanut butter is a good idea, it would add just a wee bit of texture. Smart! I don't believe I've shared a soup I've concocted with you. It's a base of either sweet potato or squash, with some pb and other ingredients. Sarah has made it! That is an adorable spoon! Sounds like this soup was as big a hit with you as it was with us. Good call on the sour cream...I used fat free yogurt but sour cream has a much better tang. Yay!!! This soup look scrumptious!!! And thanks for the shout out on the spoon! It was made for you most def!!! Love your spoon! I really want an immersion blender. I agree chunky peanut butter would have been a great addition. Still enjoyed this way as well. boil parsnips and garlic in salted water; boil until parsnips are soft. drain most of the water; add 1/4 olive oil and blend! season with salt and pepper. Oh my gosh. The spoon is precious! I love the soup as well! Sweet potatoes and nuts, I'm in heaven! I'm loving that spoon! Your photos are so pretty and I agree that this soup was mighty tasty. Ooooh...I am jealous. I want an immersion blender too! Thanks for cooking along with. I am going to try chunky peanut butter next time too. Beautiful bowl of soup. I think the addition of the sour cream would be great. I liked this one, but couldn't tell you exactly why. Good stuff. Hi Andi! Good to hear from you. Thanks for catching that, I completely left it out of the ingredients list. It should be 2 tsp of honey. Enjoy!